ON BAROQUE WINGS: VIVALDI, BACH, TELEMANN, UCCELLINI, CIMA CASTELLI E VILLE IN MUSICA 2015 is a travelling classical and baroque music festival that takes place in some of the most beautiful historic buildings of the foothill areas of Veneto. - tour of the Villa. Entrance with “conscious ticket” 5.00/10.00 €. Booking required. You can also buy tickets in the Villa, starting from 1 hour before the beginning of the concert. 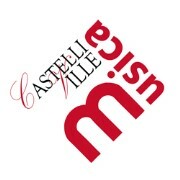 "Castelli e Ville in Musica" is a travelling music festival that takes place in some of the most beautiful historic Villas of the foothill areas of Veneto. It proposes high-profile cultural and educational events, such as concerts of international artists, master classes for young musicians, music and storytelling shows, open rehearsals and laboratories for schools; all these activities are organised and planned with the purpose of promoting our Region and its beautiful historic buildings. Ludus Musicae is a cultural association and a music school whose core principle is the diffusion of music through the attentive listening; its music courses, held by specialized teachers, address children and aim at supporting them in their musical and personal growth. The association also organizes conferences, concerts, cultural events and shows, all concerning the world of sounds. The students of "Ludus Musicae" music school also founded a small chamber music ensemble, called "Ensemble Ludus Musicae", promoting the benefits of group play among children and teenagers. In addition, not only does "Ludus Musicae" work with theatre companies, such as "Ullallà Teatro Animazione", "Glossa Teatro" and "Compagnia Teatrale Corona", but also with single theatre actors, such as Angela Graziani, Roberto Anglisani and Pino Costalunga. It also curates storytelling and music exhibitions such as "Cra,cra,crà!" and "I pulitori di vie". Finally it collaborates with the interinstitute project called "Crescere in musica", whose purpose is to diffuse a musical kind of education among teenagers and young adults of our territory. Since its birth, this original Festival has been constantly evolving: the theme of its first edition (2011) was dedicated to "folly and smiles" , to tell people not to give up believing in the great power of music; the 2012 edition involved many art forms and their relationship with music; 2013 was the year of change, and was about three different types of music: baroque, contemporary and electronic; its latest edition, "Body in music" (2014), was based on the relationship between body and music and was about the importance of rhythm in our everyday perceptions. This year's edition of our prestigious festival will take place between July and October, with the purpose to behold and be amazed, to listen carefully and to gather all the things and emotions that art gives us, through each of its expressions. Once again, the magic and the emotions conveyed by the baroque and classical music of our concerts will imbue the frescoed vaults of the most enchanting historic Villas of Veneto. This travelling festival addresses not only passionate adults, but, above all, young listeners and musicians: they will have the opportunity to take part in master classes held by famous international artists and to be themselves the main characters of some of the concerts, thanks to the orchestral laboratory "Crescere in musica". This is a great educational experience, supported by the artists themselves, who are always glad to share their talent and to give valuable advice to young musicians. Moreover, the festival will also include storytelling and theatre performances for children and families, whose music pieces are totally curated by our students. In the end, as usual, listening laboratories for schools will be held.